Objectives: Recent guidelines of the World Health Organization (WHO) indicated administering tranexamic acid (TXA) in order to treat postpartum hemorrhage (PPH). 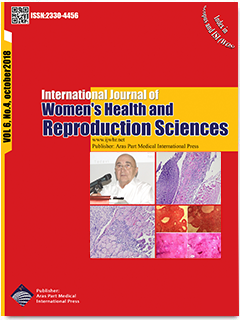 Therefore, finding low-cost and low-risk alternative methods to control obstetric hemorrhage is of great importance. The present study aimed to evaluate the prophylactic effect of TXA on hemorrhage during and after the cesarean section (CS). In addition, it was attempted to explore the impact of TXA as a safe and inexpensive method for decreasing bleeding during and after CS so that to decrease the hazard of blood transfusion or hysterectomy in these patients. Materials and Methods: This randomized double-blind control trial was performed on 60 women who underwent CS using spinal anesthesia. These women were randomly assigned to two groups. The experimental group received 1 g of TXA 15 minutes before the incision while the control group received dextrose 5% in water as a placebo. The amount of bleeding was measured during and after the surgery. Data were entered into SPSS software version 21 and reported by descriptive statistics and analyzed using chi-square, t test, Mann-Whitney U test, paired t test, and ANCOVA and Wilcoxon tests. Results: Based on the results, no significant difference was found between the groups regarding the mean age, mean gestational age, and the prothrombin time (PT) and partial thromboplastin time (PTT) (P > 0.05). The mean of the total bleeding volume was 551.8 and 713.1 mL for experimental and control groups, respectively which means that a significant difference was observed between both groups in this respect (P = 0.006). However, no significant difference was noted between the groups regarding changes in hemoglobin (Hb) concentration, systolic and diastolic blood pressure (BP), and heart rate. Conclusions: Generally, administering 1 mg of TXA in CS significantly reduced the volume of PPH. However, it did not cause significant changes in hemodynamic state or Hb level. Therefore, it can be recommended as an appropriate treatment for these patients.